One of the greates things ever in my opinion is the fact that hippos are graceful swimmers. They are so big and bulky on land, but get them i water and they are like nymphs gliding along in their element. 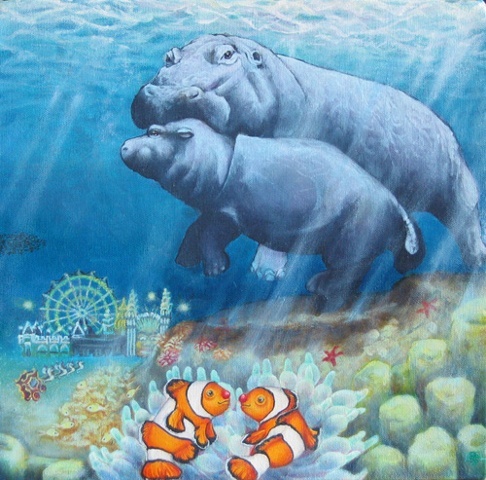 I imagined this hippo Momma and her Baby swimming along and underneath them in the watery distance, there happens to be an underwater carnival taking place at Luna Park. The calliope is racing along to lead everyone to the carnival while the two clownfish spy on the passing pair. This painting is sold. I do have matted fine art prints for $29 and fine art cards for $6 available. Please contact me if you are interested.